One of the unique delights of selling books at the Berkshire Hathaway Shareholder’s meeting is that you get to meet people from around the globe who come to the capitalist’s version of the the Holy Land to try to soak up some wisdom from Warren Buffett, and maybe just even catch a glimpse of the man. This year John Prescott and I were there to sell our book, “The Oracle’s Fables” and we met people from France, Holland, China, Japan, India, South Africa, New Zealand and my surrogate home, Australia. There was a small group of Aussies who had made the pilgrimage to Omaha, and they came in the bookstore to search out some titles. “Australians?”, I asked. They quickly enjoyed being noticed, and we had a great conversation. I then asked them if they ever remembered seeing a little duck who appeared on the cricket broadcasts on GTV-9. 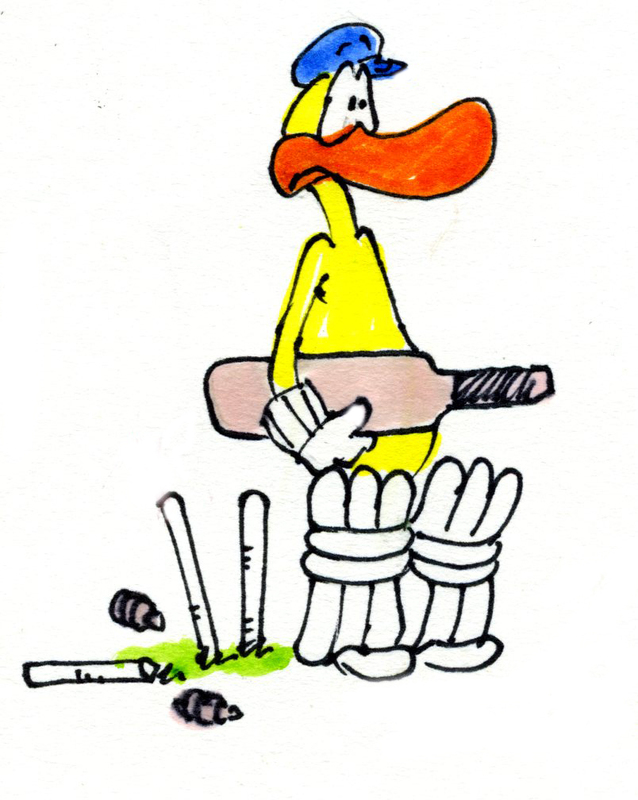 The character’s name was Daddles, and he strode sadly across the bottom of the screen whenever a batsman went out without scoring any runs (it’s called going out for a duck, and it’s humiliating). When I informed them I actually drew the character, they went nuts. They all wanted to have their picture taken with me. It was a mob selfie. I read somewhere that the pommies (the English) hated it, and that is reward in and of itself. I imagine that they never thought they would come 16,000 miles to run face to face with Daddles’ creator. For me? It’s incredibly rewarding to know that you’ve made an impact.